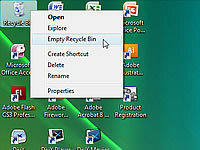 You can empty your entire Recycle Bin on your Windows XP desktop at any time. Deleting items forever from your Recycle Bin frees up hard drive space, and Windows XP helps you out by deleting older items from your Recycle Bin automatically when your hard drive is low on space. Emptying your Recycle Bin is much easier than hauling your real trash to the curb. 1Right-click the Recycle Bin icon. You can find the Recycle Bin icon on the Windows XP desktop. This option is on the menu that appears when you right-click the Recycle Bin icon. 3Click yes in the confirmation dialog box that appears. A progress dialog box appears, indicating the contents are being deleted. Remember that after you empty the Recycle Bin, all files in it are unavailable to you.